If you don’t know what a shawarma is, this recipe will not particularly surprise. But, if you know shawarma, you could be forgiven for uttering a popular acronymed Anglo-Saxon epithet beginning with W and ending with F. If you are from the Levant, you will no doubt be thinking an equivalent in Arabic or Turkish. Just perhaps not as rude. But, even if you are a shawarma traditionalist, I hope I can convince you that yes, tofu, that shape-shifter of the vegetarian world, can be extremely scoffable. At least in an exotic shawarma disguise. My tofu shawarma won’t of course taste of lamb or chicken, and neither would I want it to. We have had quite enough worry here in Europe about what is actually in our food (#horsemeat). But this fat-shaved, vegan shawarma will be delicious, as only anything can be if marinated for 12 hours in 12 spices. So shawarma, that juicy, dripping fast food staple of the Middle East, a good chunk of both North Africa and South America, and surprisingly, Ottawa Canada. Those of you of a sensitive disposition look away now….No really…..Skip down two paragraphs. Past the next two photos. Okay, the rest of you, shawarma is simply the most delicious way to enjoy lamb. Forget your mint sauce, and your rosemary bits poked in, this marinated lamb is the business. Roasted slowly on a vertical spit, the lamb is then shaved off and shoved into griddled white pittas or lavash, and topped with salady bits and heavenly garlicky sauce. Often with bayonet-sharp French fries on the side. “Oh a kebab, she’s on about doner kebabs”. Well yeah kind of, but not quite. From what I can gather the spicing can be quite different, as well as there being different ways of preparing the meat for roasting. Same with Greek gyros – to which shawarma is more similar. Perhaps, at least in the UK, it sounds better to say, “I fancy a shawarma” rather than “I fancy a kebab”, the latter bringing to mind pub-kicking-out food, with folk clustered under strip lights, wavering in and out of lucidity as they order that famous alcohol mopper-upper. Harsh words, but the humble yet noble doner kebab has been hijacked by a drunken minority. Non-drunk people may get equally giddy about shawarma. Who knows. So, this vegan shawarma. I have made ‘proper’ lamb ones using leg of lamb and Messrs Ottolenghi and Tamimi’s superlative recipe (found in their must-have collaborative Arab-Israeli cookbook, Jerusalem). To great reviews I should add. But I thought that if I personally were to eat this type of dish more often than occasionally, I would be worried about health repercussions and my middle-aged waistline (the latter of which is already a worry). I won’t get us all on a downer by standing on my soap box – conveniently situated right beside me in case of moral emergencies – but there are big risks associated with big meat intake. And not just being unable to zip ones trousers. With this simple, but slightly ingredient-heavy recipe you have the taste and the experience of the full-throttle version. But in the food equivalent of a Prius perhaps. A full-spec Prius. With a supply of napkins. You may look at the list of ingredients and think this recipe is for the spice-geek only. I mean, 12 spices? Really? Trust me, even if you only have a few of them all will be fab. Cardamom, cumin and cinnamon would be my must-haves if pressed. Garlic, salt and a healthy thumb of fresh ginger are also musts. But honestly, wing it with the rest. If you have allspice (which I didn’t use) – fling that in as it covers a few bases in one go. Chuck in caraway too if you have that. Every shawarma maker has their own special mix anyway. You could be really clever and get ahold of a jar of Lebanese 7 spice mix (baharat) and skip my suggestions all together. The idea is to spice that tofu up out of all recognition. The only other must is marinating time. You can get away with a few hours for meat but with taste-free tofu (sorry, it’s true) overnight, or even two days, offers a good infusion of needed flavour. And with that, I hope your initial “What the ****” turns into an big, sloppy “Mmmm”. And don’t forget the napkins. What traditionally meaty recipe have you veganised lately? What was the verdict? Last year: Pomegranate, Pistachio & Sour Cherry Bulgur Wheat Salad – this would taste great with the tofu shawarma. Miss R’s Track of the Week: ‘High Hopes’ by fabulous Irish rockers, Kodaline – beautiful but harrowing video (spoiler alert: happy ending); tender, heart-tugging lyrics. This decidedly different take on the very meaty shawarma is surprisingly good, even if, like me, you enjoy the meaty original. It is so tasty in fact, that I ended up eating the whole thing (ie, a 400g pack of tofu, etc), and licking the pungent sauce from the plate. Not terribly ladylike, but there you go. In the Levant, where this originates and is the fast food of choice, a lemony tomato and cucumber salad and fresh soft pitta are musts, but other options – garlic sauce, tahini sauce (I’ve just ‘watered down’ hummus here), skinny fries, mouth-puckering pickled turnips and an intriguing pickled mango and fenugreek sauce called amba (which I think is also the name of one of Mick Jagger’s grandchildren) are up to the vendor, and customer. After I had taken the photos for this post I ended up swirling sriracha sauce over the whole affair, which looked pretty and tasted even better. Maybe I should try and make the Middle Eastern version of sriracha, skhug, to bump up my shawarma cred a bit more. 1. Pop all of the spices into a hot, dry cast-iron, or other heavy pan and dry-toast over a medium heat until they start to become fragrant – about one minute. Carefully add the spices to a spice grinder, or similar, and whiz until you have a uniformly powdery mix. You can skip the toasting step, especially if you are using pre-ground spices or a prepared mix. But I think it is worth the extra minute or two. 2. Put the spice mix into a bowl and stir in the grated gingerroot, garlic, lemon, coriander and oil. Mix well. 3. 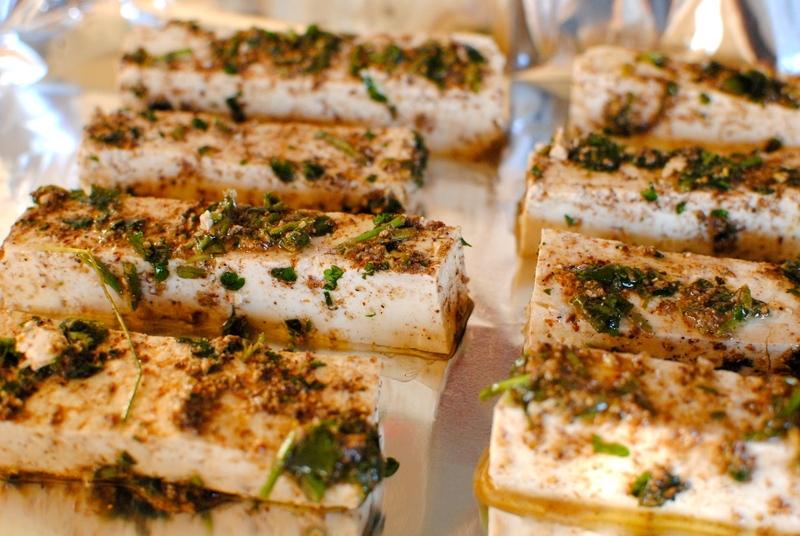 Lay the tofu pieces in a non-reactive dish – Pyrex or ceramic are best – and pour the marinade over the tofu. Use your hands to carefully turn the tofu until all sides have some spices.Tightly cover the tofu and pop into the fridge overnight, or for at least eight hours. 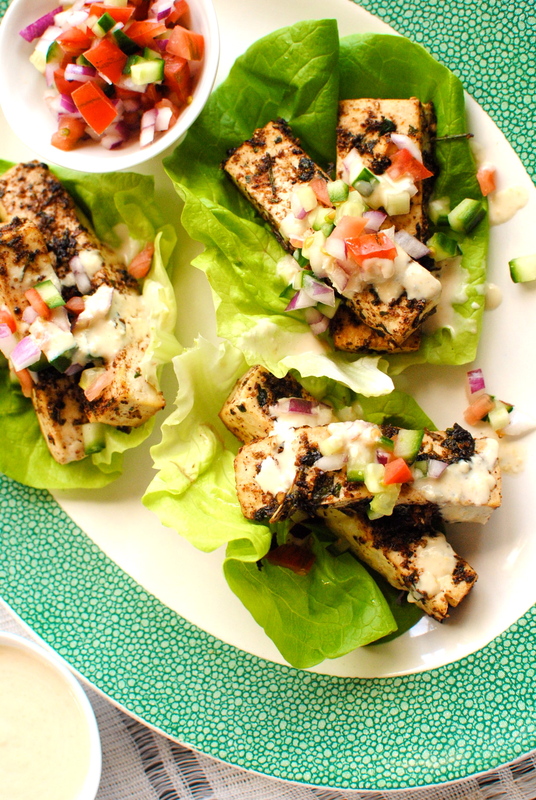 If you are able to, give the tofu a turn around in the marinade at least once. 4. 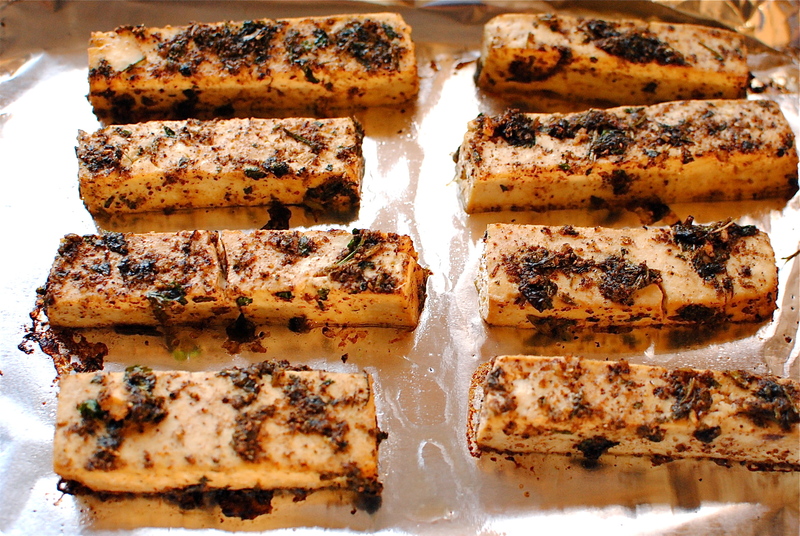 When you are ready to eat, remove the tofu from dish, pat it of excess moisture and place onto a foil-lined baking tray. Bake the tofu at 200C/400F for about 20 minutes, or until starting to turn golden in patches. Bake longer if you want it less soft, but I like the contrast of crunchy leaves and salad with the softer tofu. You could also grill/broil it on each side until starting to colour to your liking. Brush with more oil to aid cooking if you need to. 5. You may like to strain the marinade of the coriander and heat it as an extra reinforcing sauce. 5. 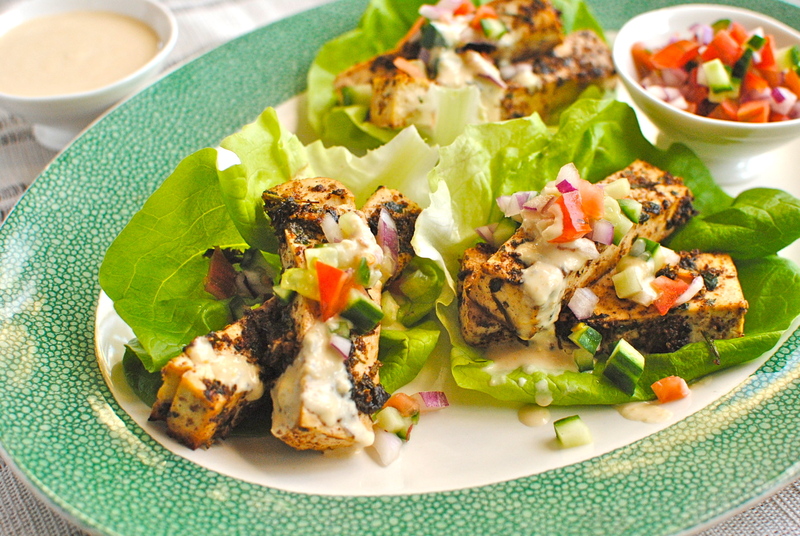 Serve with warmed bread, in the lettuce cups or even over some cooked grains like quinoa or wholegrain couscous. Top with any of the suggested accompaniments. Gorgeous as usual Kellie. I would love to try this with tempeh instead of the tofu. I replaced the ground beef in my chili with buckwheat and the family actually prefers it! Great suggestion about the tempeh. I have a hard time getting the family to eat tempeh but I am posting a tempeh satay recipe that passed muster fairly recently. If I were to pop tempeh in as a suggestion do you think I should tell folk to steam it first then marinade? I usually steam my tempeh but I know not everyone does. Also, buckwheat chilli – awesome! Yes, lots of lovely sriracha and some homemade flatbreads (made with yogurt). Did you mean that your husband makes homemade sriracha, or the shawarma. Either way – result! This is great Kellie! I think tofu is actually the perfect vehicle here b/c it is absorbing all of those amazing flavors!! Can’t wait to try this recipe! I have all the spices at home. BTW, Beautiful clicks…..! This looks absolutely delicious and ‘thank you’ for nudging me to marinate a litle longer than the 4-6 hours I normally do! 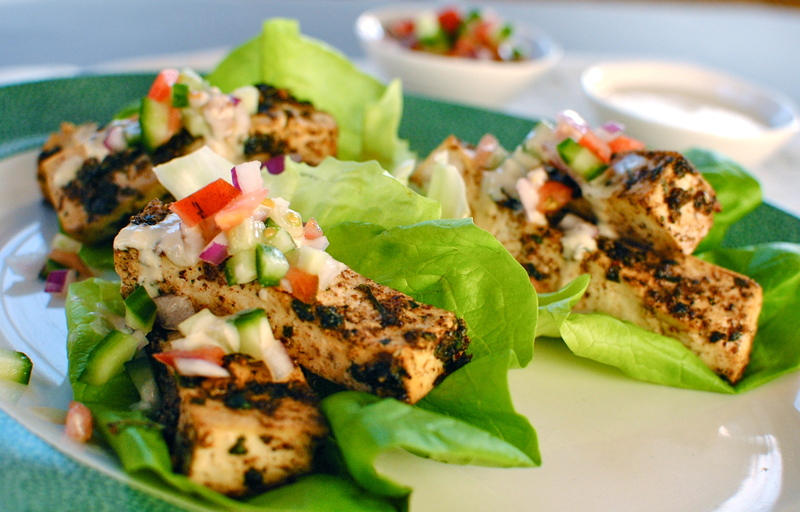 Must admit this recipe has usually been used on meat, but since I love tofu there are no problems! Hmm – except Sydney has some fabulous small family-owned spice mix specialists, and I have been enjoying their lovely big, fresh bags of baharat /schwarma mixes! Lazybones!!! Eha, if you have great spice mixes from specialists I wouldn’t hesitate to use them. I played around with Ottolenghis mix so yours will have authentic shawarma proportions. I just thought this balance and marinating time was more helpful for tofu. Thanks for even considering a tofu version! I love finding recipes that take traditional meat dishes and change them into something vegetarian. My favorite meat sub is tempeh. It soaks up marinades really well and has a great texture! I bet this recipe would be great with tempeh too! While I love lamb, and spit-roasted lamb sounds particularly delightful, I also love how you’ve found a meatless option. 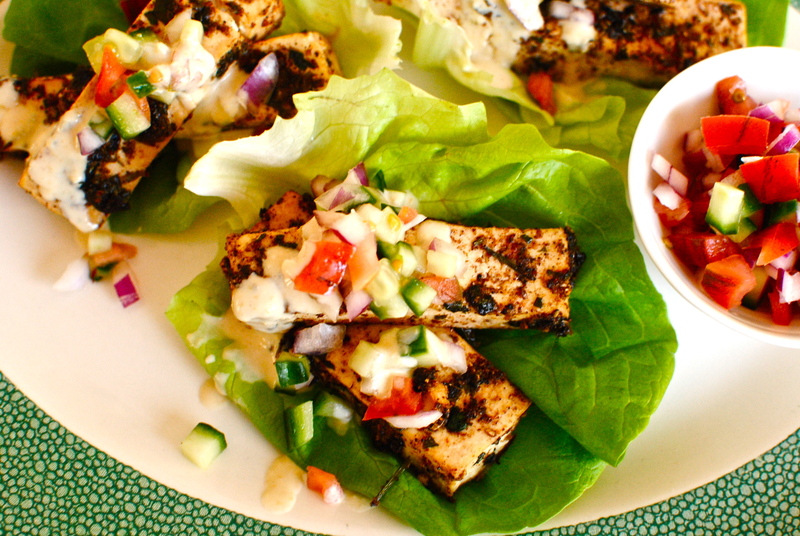 And anything to dress-up and pack in flavor to tofu is welcome! This sounds delicious and so glad you shared! This does look really good Kellie. I’m a tofu marinader too but I must admit I tend to wuss out and only marinade it for a few hours as I’m worried about it getting too soggy and falling apart even more easily. But I shall give it a try for a whole day next time! I think if you press it of its liquid first, and it’s a pretty firm tofu, it should be absolutely fine. I should probs go and stipulate on the post as some folk not familiar with our soy cake friend may just get the UHT stuff, which is always very soft. I will go and amend that soon! Skhug??!! How had I not heard of that? This sounds so good I might even buy some tofu (another pet hate of mine) and try this out. Marinating it for a looong time has to be the way forward, you know your stuff. I have always been disappointed in the past! There was one exception and it relates to your veggifying meat question too. I made an Indian spiced scotch egg oncenusing tofu as the “sausage” it was delish! I know! I didn’t know about it until I did a little research. I love another opportunity to discover hot sauce 😀 And what a great idea about the tofu scotch egg. Is it on your blog Natalie? Pingback: Herbs on Saturday February Round-Up and the Winner announced! Well, I’ve just sitting having my lunch which consisted of bits and bobs I had in the fridge (spot the home worker) and while eating it I suddenly thought of the question you asked your readers here. I don’t like vegetarian haggis but this description of your fabulous lunch had me near to drooling. If only I had known I would have driven to your house and presented my self at your door! I absolutely love tofu. I’m always looking for new tofu recipes! This sounds so good! Just made this for my after-work dinner – so delicious and surprisingly quick and easy, at least using ground spices rather than whole (no mortar & pestle, alas)! I cooked half the batch of tofu without giving it any marinading time and it already tasted great 🙂 I’ll be able to compare tomorrow evening with the half that gets to marinate overnight. This is a really practical recipe for those like me who are cooking for one. Thanks and please keep the tofu ideas coming! I love it and never have enough tofu recipes. Thanks for such terrific feedback. I am so pleased that a quick version works too – I hope people read your comment in case they are deterred by waiting/planning for this recipe. Please have a look at the recipe index at the top for other tofu recipes – it shares a category with beans. If you take the short drive from Ottawa to Montreal, you’ll find another cluster of shawarma lovers – and it’s one of the many foods I craved when I first moved to Asia. These days, when I head to middle eastern places, I gravitate to the veggie options (which rock) – though I’ve been know to give a longing glance at the roasting meat on the spit, all the while reminding myself of sheeps’ massive carbon hoof prints. Absolutely love this idea, both for seitan (and not just because of the ping back – though thanks for that) and tofu. Looking forward to trying this (when I’m reunited with my kitchen – a sentence I write far too often). would this work with chickpea tofu [shan or burmese tofu] ?